Have you ever wondered who would take care of matters if ever you find yourself lying unconscious in a hospital bed, rigged to life support? Other people have wondered the same thing. There is a long-term answer for situations like this. 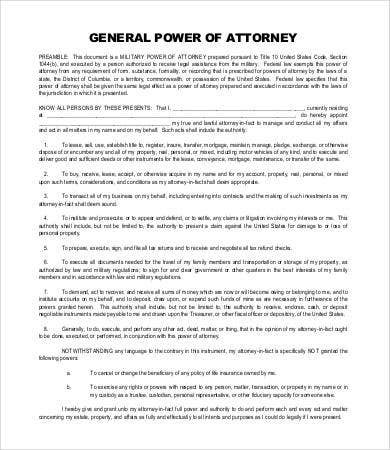 A power of attorney (POA) form is a Contract Form that officially authorizes a person to act as an agent on your behalf, making important decisions in areas of your life: legal matters, medical directives, business assets, property and financial affairs, as well as your personal life. 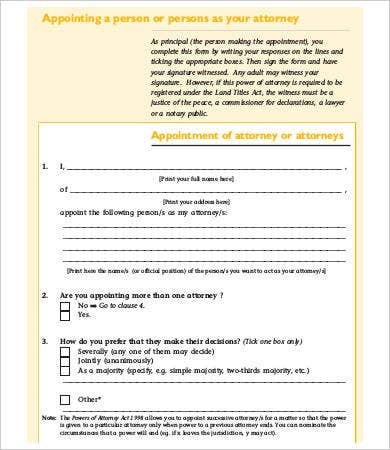 This person becomes your “attorney-in-fact,” with you as the grantor or principal. Here we have collected a sizable list of free POA forms that you can download as Word documents and PDF files. 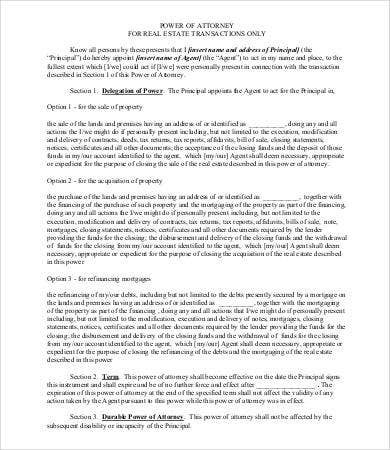 This can be an invaluable reference to what a POA form will entail should you decide to draft one. 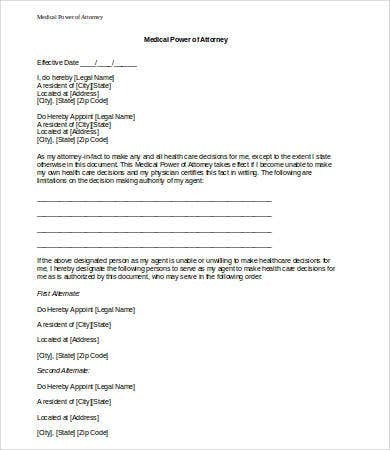 These are General Power of Attorney forms, which means the agents you assign with these forms have general decision-making power over your life when you are otherwise incapable of acting on your own will. Springing. Under this kind of POA, the agent’s powers will come into effect only under certain circumstances. 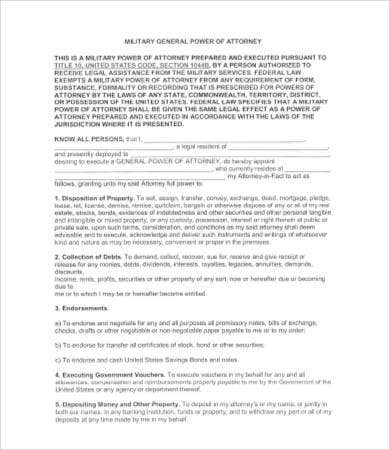 One good example provided here is the Military General Power form – in this case, the agent can only act on your behalf and with your permission when you are drafted into military duty and are unavailable to make these important decisions in other areas of your life. Durable. 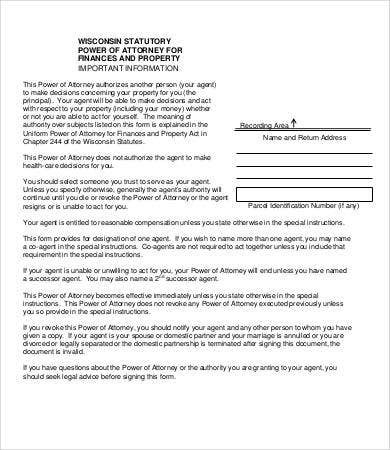 In this case, the agent’s power is effective immediately after completing and signing the form, and will last until the principal’s death. After that, your last will and testament will come into effect. If all this sounds gravely pragmatic, that’s because it is. 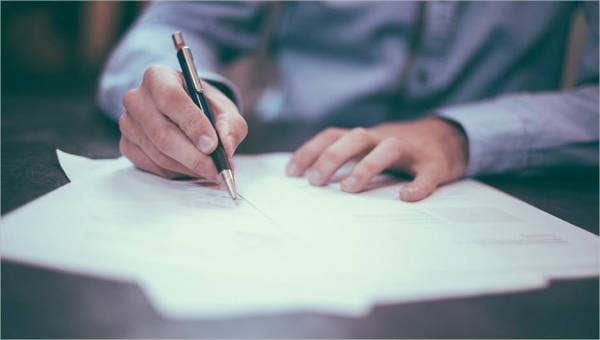 If you’ve ever had to sign a Non Disclosure Agreement Form you can readily understand the formal trust in this contractual relationship between principal and attorney-in-fact. 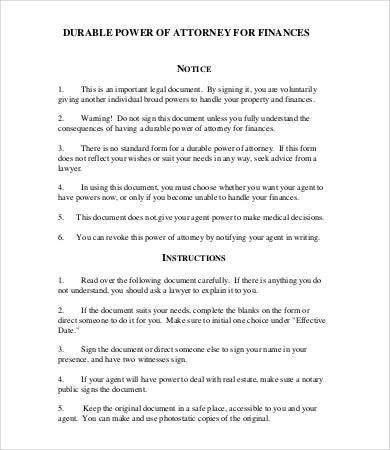 This will be important for your agents to know if they are to take over these matters for you later on. You will have to meet with these chosen candidates and explain to them what you’re doing—why you’re granting them this power and what the terms and limits power are. 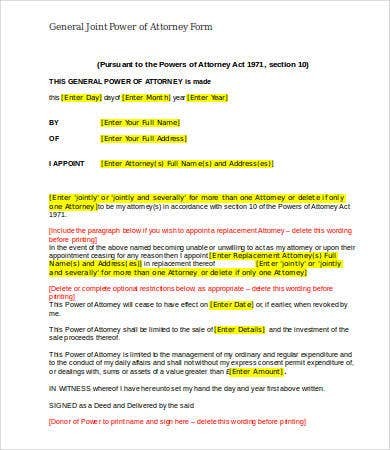 Remember that you can appoint more than one agent, and you get to decide whether they make decisions together (see the General Joint Power of Attorney sample listed above) or separately. A joint power is a good way to ensure no one gets too much power. All the co-agents will have to unanimously agree on a decision before it can be pushed through. 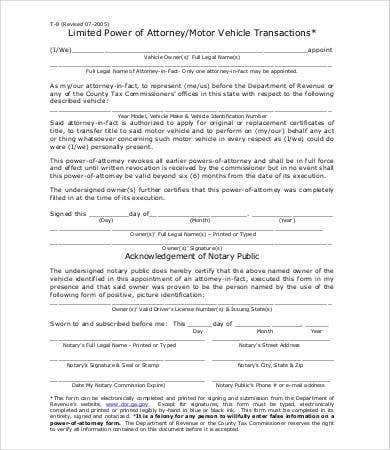 Have your willing and trusted agents sign the document in the presence of a notary public and witnesses. 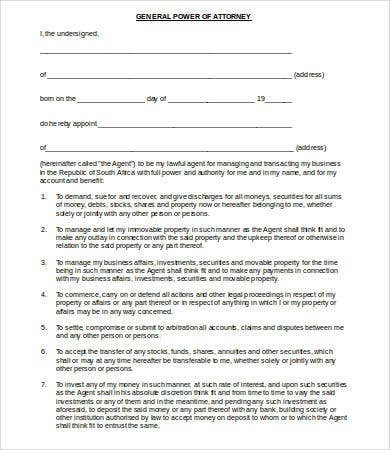 Think of this contract as a kind of glorified Promissory Note Form with very real practical and legal benefits.